I haven’t worn a Halloween costume in years, but decided to change that for 2013. After 10 years of a tumultuous relationship (8 years of which we were married), I filed for divorce in May and have been riding the “rollercoaster of emotions” since, working through all the heartache and also adjusting to “sharing” our 4-year old daughter. Thanks to my wonderful support system of family and friends – as well as private counseling – I realized that due to all the stress I had to handle in the relationship all those years (as well as my husband’s consistently bitter and negative attitude on life and society), I had lost a great deal of the optimistic and jovial spirit that so many of them treasured as my best personality feature. So, as Kim and Jason say, this Halloween was my “permission granted” chance to reclaim my spirit of silliness and childlike innocence. 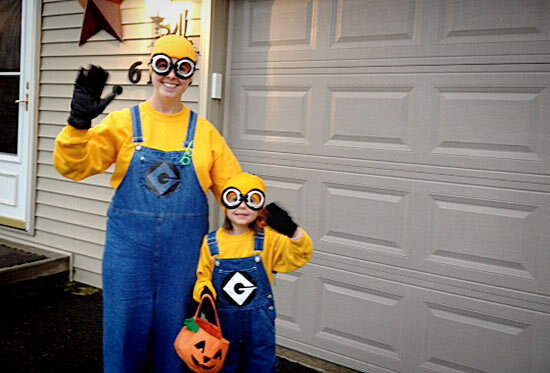 I assembled costumes for both me and my daughter, and what better way to be silly than to be a “Despicable Me” minion! I wore the ensemble to my work on Halloween — I was the only one in costume in my entire office of about 50 professionals — and gave many people good laughs when they saw me, which felt awesome. I publicly shared my silliness with my daughter as we walked the neighborhood trick-or-treating on Halloween night, and I also helped out some of my colleagues with a “Trunk-or-Treat” event in our community earlier during the week of Halloween. While in my “minion” costume, I talked “minion” for over 3 HOURS while kids of all ages walked past me in line and gave me high-fives. The best part was -– in true mischievous “minion” fashion -– I would sometimes tease the child going to high-five me and pull my hand away fast and then laugh the “minion” laugh. It brought smiles to many, and then I’d make sure to give them a successful high-five before they moved on. So for this gal, I would say this Halloween ended up with a score of Me: 1, Adultitis: 0. And I guarantee I’ll be thinking of a new and silly costume for next year. Family and friends are all thrilled to see me reclaiming my life and returning to my “silly prior self.” And it’s a wonderful feeling for me, too, as I believe I can be an even better, happier mom for my daughter. And that, to me, is the most important take-away from this experience. I vow to never allow anyone or any circumstance take away my spirit again.